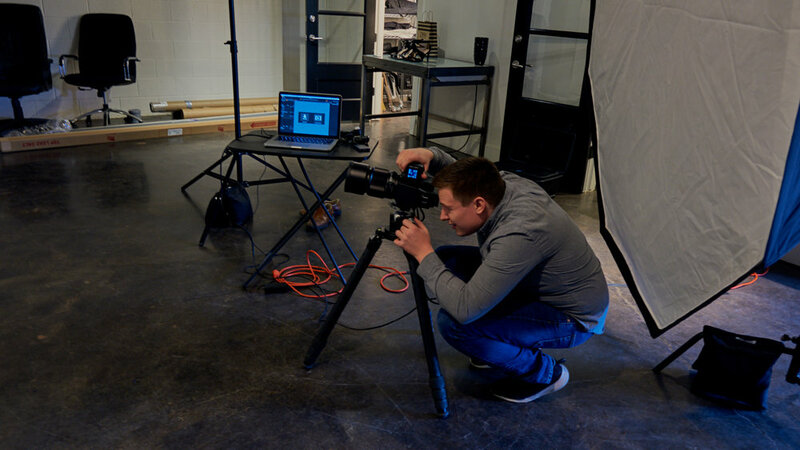 We just had our first shoot in our new studio space! We pushed our model, Gabriella, to the limit, having her jump in an evening gown (sometimes with heels on). 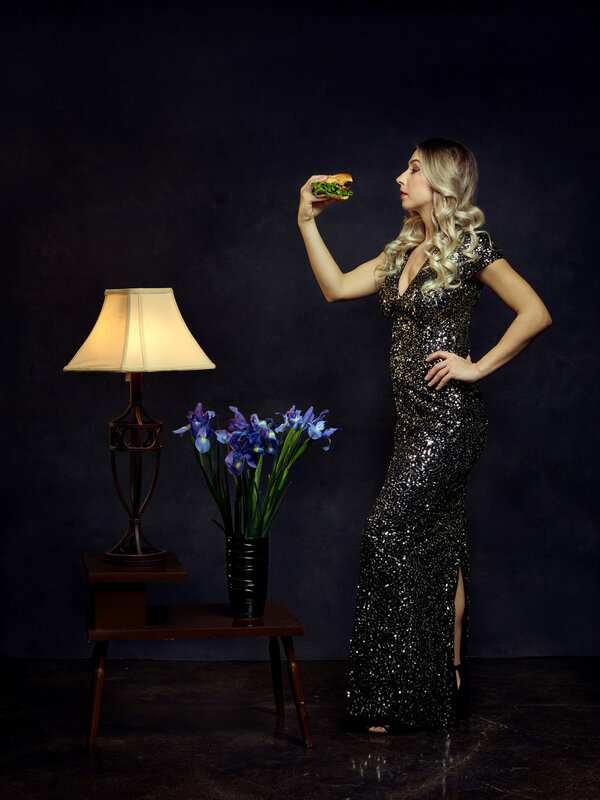 The overall focus of the shoot was to explore some contradictions, thus the jumping and burger-wielding all in evening gown. We found out after starting the shoot that Gabriella had a background in dancing. It quickly became very apparent. We also had Gabriella wrangle a burger. Special thanks to Fat Jack's (and Bobbi Jo) for providing good looking (and dang good tasting) burgers. If you're in Salt Lake City, give them a try! Fun fact: the light in the lamp is not from a lightbulb, but from a wireless camera flash that Mike rigged up inside of the lamp shade. We had a total of four wardrobe changes, and two different hairstyles, all in four hours (and only three hours of shooting). Here are some behind the scenes photos (taken by me, not Mike, so you may (will?) notice a lower quality). You can see Mike's camera set up here. It's tethered to his laptop so that he can instantly review each photo and make adjustments for the next one. Joseph, our shoot assistant, stood in with the color checker as Mike made some lighting adjustments with the 4-foot floppy (an expandable flag). We used about 8 different lights, with soft boxes of varying sizes, as well as umbrellas, all with a white paper backdrop. Special thanks additionally to Nicole, our makeup and hair artist. We had a blast with this shoot and are very happy with the results! We have a new backdrop. And yes, it came from Serbia. To be honest, we were a little hesitant to try the Unique Backdrops out, but the backdrop arrived without problems and has surpassed our expectations. It is high quality but at a much lower price than other professional backdrops. Check them out at their website unique-backdrops.com. Here is the backdrop in all of it's glory. (Forgive the sunlight; our studio manager is vertically challenged). This backdrop is a medium level texture. (Mm, mm, texture!). We have officially moved in to our new studio space! The studio is in downtown Salt Lake City. We are very excited about it. It's just the right amount of space for shoots, and has a make-up/prep room, and an office as well. We are even sharing the building with an ad agency. They are great neighbors and have helped us feel at home. The main studio space, complete with floors, walls, and comfy chairs. Our office, where the magic of administration, editing, and wheely chairs happens. On the right is the office. On the left is our make-up/wardrobe/prep room.